The combination of essential oils in Defense™ blend is one of the four go to powerhouse essential oil blends offered by Be Young to help stimulate and waken up the body's natural defense systems. Blended using some of the most powerful aromatic compounds availble studied and renowned for their ability to effect the immune system. When used in combination with Spice of Life, Guardian, and Boost you will bounce right back when the yearly cold or flu comes around. Apply 10-15 drops to your diffuser to assist with purifying a room. Add 2-3 drops in a veggie capsule, fill the rest of the capsule with a carrier oil and take orally in the morning. 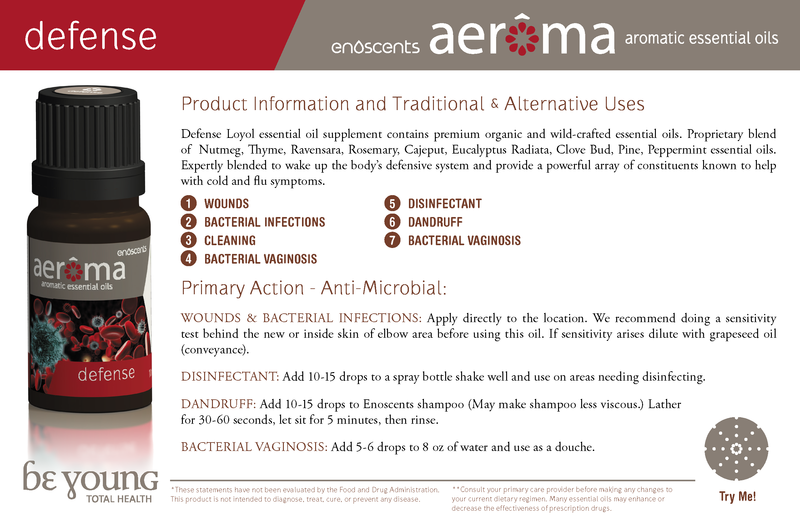 Apply 2-5 drops directly on desired location as to assist with bacterial infections. Product Name: Sri Lanka Nutmeg Oil. of the dried ripe seed of Nutmeg. Appearance: The oil is colorless to yellow. Odor: The odor is fresh, typical for nutmeg oil. Dilute Defense™ blend by 75% with a carrier oils to assist with bacterial diaper rash. Dilute Defense™ blend by 50% with a carrier oils and use as a swab for ear mites in you pet. Apply 5 drop of Defense™ blend in quart of warm water, shake well and apply to face to assist with acne. Apply 10-15 drops to a diffuser and diffuse near your pet to help with distemper.